Jimmy Wilson serves it up again in his latest work FUTURE HISTORY"They say that in order to plan for the future you have to remember the past. 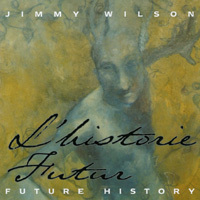 I guess Jimmy Wilson had this in mind when he made his album, Future History. 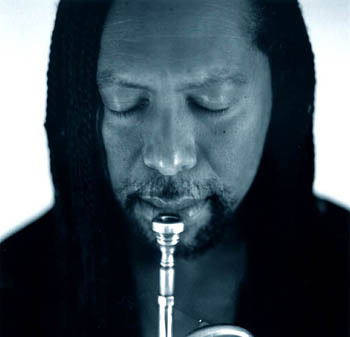 With shades of trumpeters gone before, he takes Lee Morgan, Clifford Brown and of course Miles and merges them with his own experiences to create a melting pot of new sounds. From muted melodies, enhanced with sweet electronics, to bursts of note clusters, played with bravado and a big fat tone, he comfortably wings his way from the 1950's to the present and the future. 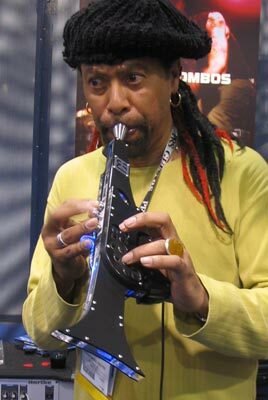 At the Samson/Hartke booth I ran across a guy named Jimmy Wilson playing this very cool trumpet MIDI controller. It's made by a company called Morrison and available through Patchman. The keys on the side control the range (octaves and 4ths) of the notes generated. There are also a number of other buttons that control trill, portamento, sustain, patch change, etc.